Karen Gross is an author, educator and storyteller. Previously, she was president of Southern Vermont College and served as a Senior Policy Advisor to the US Department of Education. Prior to that, she was a law professor for 2 decades. Currently, she is Senior Counsel to Finn Partners where she specializes in crisis management. An expert in trauma and disaster planning and relief, she is certified as a provider of PFA (Psychological First Aid) and enrolled in a clinical certification program in trauma at the Rutgers Graduate School of Social Work. She resides in Washington, DC, home to the famous Smithsonian National Zoo. Karen has worked with Marc, Max and Debbi on many projects. Marc Wine is an experienced health care administrator and innovator. He has served in a variety of positions within the Federal government for more than 30 years and has also worked in the private sector, all to promote improvements in healthcare. He is deeply engaged in the use of technology and artificial intelligence to improve health without sacrificing the need for human engagement and personalized care. He has written a groundbreaking book on health innovation and hundreds of articles, including with Karen, on all aspects of healthcare delivery, technology and Big Data. Marc has given speeches across the US; he also served as an adjunct professor at George Washington University. He is a saxophonist and was part of a jazz band called Subterraneans for many years. Max Flatow is a New York based photographer. Born, raised, and currently residing in Brooklyn, Max specializes in food and portrait photography, working with chefs and restaurants across the country. He is well-known for his photographs of food and now giraffes. 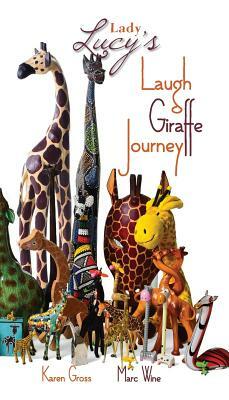 Max and Karen have worked together on many projects over the years but never a giraffe book! When he's not taking photographs, he enjoys every waking second with his wife and two sons, hiking, camping and exploring the great US National Parks. Debbi Wraga is a graphic designer living in Vermont. She is thrilled by the incredible books and covers she has been able to design for authors. Being able to collaborate on Lady Lucy has allowed her to touch the hearts of children all over the world. Debbi enjoys the fusion of an author's vision with the creative process and continues to freelance graphic design work. She spends her free time relaxing by the ocean with her husband, her two children, Tolkien and Tori, and her two furrbabies, Raya and Goliath.